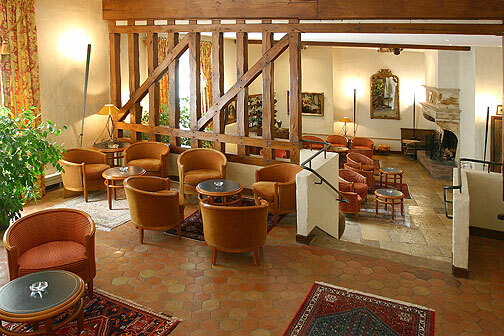 Hotel "Le Relais Bernard Loiseau ****"
The food of Bernard Loiseau lives! We wrote about Bernard Loiseau, his food and his dreams and development of the old restaurant "La Côte d'Or" back in the 1990's before his self inflicted death (24 February, 2003). Back then, a few years after he had received his 3rd Michelin star, he immediately became our favorite chef both for his warm and generous personality as well as his culinary talents and the transformation and enlargement of both the restaurant and the hotel. After his funeral (28 February, 2003) we wanted to give his wife Dominique enough time to recover and take over the reins of the Loiseau empire before again testing this fabulous spot in north western Burgundy, just a couple hours from Paris. We wrote about Bernard Loiseau, his food and his dreams and development of the old restaurant "La Côte d'Or" back in the 1990's before his self inflicted death (24 February, 2003). Back then, a few years after he had received his 3rd Michelin star, he immediately became our favorite chef both for his warm and generous personality as well as his culinary talents and the transformation and enlargement of both the restaurant and the hotel. 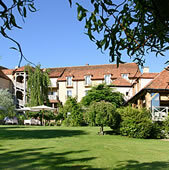 After his funeral (28 February, 2003) we wanted to give his wife Dominique enough time to recover and take over the reins of the Loiseau empire before again testing this fabulous spot in north western Burgundy, just a couple hours from Paris. We allowed just over a year and again tested this wonderful hotel and restaurant this spring, 2004 and found that despite his death, his legacy of quality has not only been continued but enlarged upon both in the restaurant and the hotel which now boasts spa and fitness facilities as well as a new play room and nannies for the kids, a new billiard room, library, swimming pool and even a doggie sand box in a private corner of the garden which over the years has been delightfully transformed into a lush English garden with meandering pathways, shady trees, colorful plantings and many intimate nooks and crannies. Many new deluxe suites and rooms have been added over the years since the first 5 luxury suites were inaugurated. All the latest additions are fully air-conditioned. Those on the ground floor have their own private, fenced patios while many above have their own balconies. 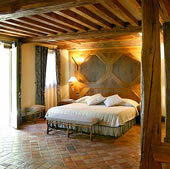 All are spacious and styled in an "haute rustique" approach with exposed old timbers, antique tiled floors and fireplaces. This is a place that is glorious in beautiful weather and cozy on a chilly winter day. Truly a place for all seasons and a great escape from Paris. Enjoy the public rooms where there is plenty of space to enjoy privacy, have a drink, afternoon tea or read a book by the huge baronial fireplace. 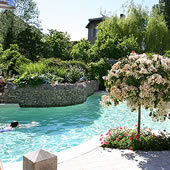 There is a fitness with sauna, steam room, exercise equipment and counter-current pool. A spa facility sits alongside the children's play room so Mom's can keep an eye or an ear on their offspring while have their beauty treatments with top-of-the-line European skincare and relaxation treatments. All this helps to make possible a greater enjoyment of the really superb cuisine that still defines Loiseau’s restaurant under the skillful direction of Patrick Bertron, 20 years his former sous chef, and who has retained the three stars won by Bernard Loiseau in 1991.